Certified nurse assistant in Nevada probably earn hourly and annually mean wage of $15.45 and $32,130 respectively, according to the information given by the US Bureau of Labor Statistics, as of May 2013. In the same year, the state employed 4,770 CNAs and employment per 1,000 jobs was 4.14. 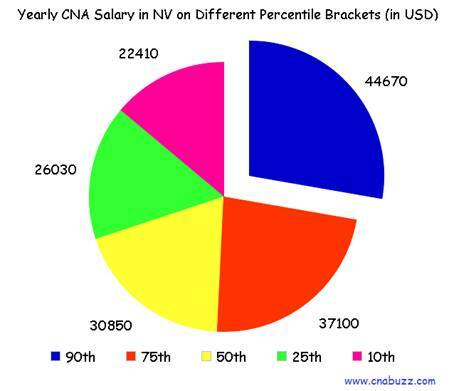 Average annual CNA salary in NV, in January 2015, according to the figures provided by indeed.com was $19,000, which was 24% lower than the average salary of a nurse aide for job postings nationally. 90% of CNAs made less than $44,670; 10% made more than $44,670. 75% of certified nurse assistants earned less than $37,100; the remaining 25% earned more than $37,100. 50% of the employees earned less than $30,850; the rest 50% earned more than $30,850. 25% of CNAs were paid annual wages less than $26,030; 75% were paid more than $26,030. 10% of employees were offered less than $22,410; 90% were offered more than $22,410. Cost of living and geographical location are some of the major factors that significantly affect the CNA salary. The table shown below consist the salary details of different cities of Nevada. The highest median annual pay was offered by Carson City, i.e. $31,786 while the lowest Median annual salary was provided by Reno, Sparks and Sun Valley, i.e. $30,498. The median hourly salary of all the cities in NV was $15, as per the figures provided by salary.com. There are a number of job titles in Nevada. 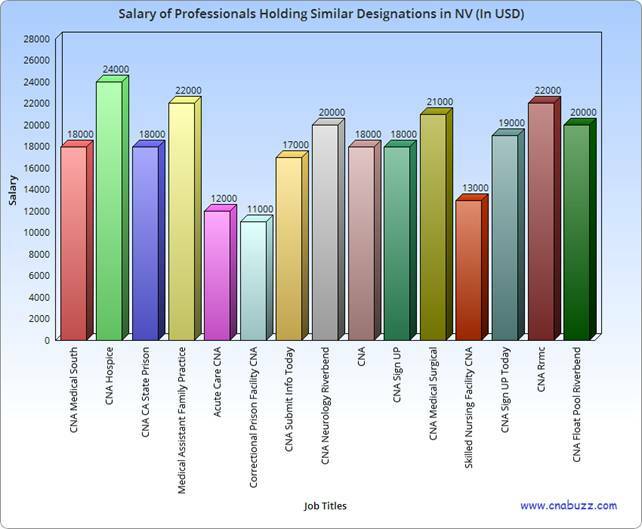 According to the below table, CNA Hospice were the highest paid professionals with a salary of $24,000 while Skilled Nursing Facility CNA received the lowest income of $13,000. The high demand of healthcare professionals for elderly people can raise the job opportunities of certified nursing assistants. This projected growth rate is likely to create 312,200 new positions by 2022, i.e., the rise of approximately 21 percent over the 2012-2022 decade, according to the BLS reports. Question 1 – What is the annual salary range in the different cities of Nevada? Answer – In NV, the annual salary range is $30,643 to $31,786 with the maximum number of cities providing an income of $30,643 per annum. Question 2 – Suggest me some top paying job titles in the state? Answer – CNA Hospice is the topmost paying job title that provides a salary of $24,000 to the CNAs. Other job titles include CNA Rrmc ($22,000), Medical Assistant Family Practice ($22,000) and CNA Medical Surgical ($21,000).